Any move-up family will find the stately elegance of this spacious, four-bedroom country farmhouse with bonus room and twin fireplaces strongly appealing. The spacious great room is open to the kitchen/breakfast area, and the living room/study is set off by elegant columns. Both the breakfast and great rooms are open to the covered porch with open deck and spa area. The second floor master suite features every luxury, including a whirlpool tub, shower, and double lavs. You can easily access the bonus room from the first or second floors. 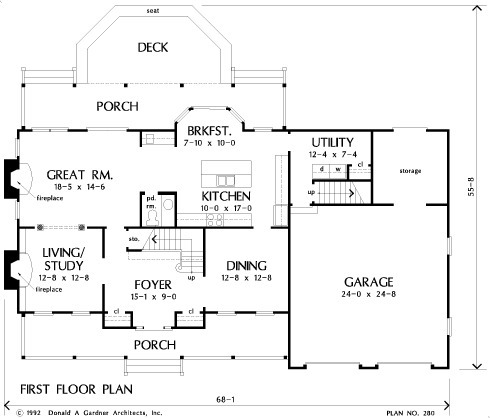 1st Floor: 1381 Sq. 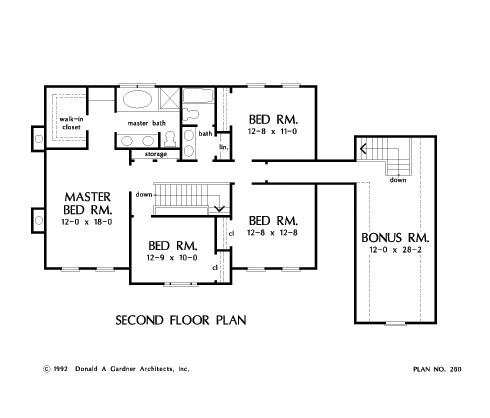 Ft.
2nd Floor: 1135 Sq. 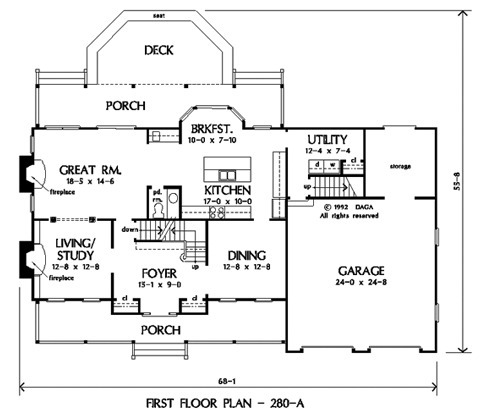 Ft.
House Dimensions: 68' 1" x 43' 8"
Great Room: 18' 5" x 14' 6"
Master Bedroom: 12' 8" x 18' 0"
Porch - Front : 40' 9" x 7' 0" x 0' 0"
Porch - Rear : 40' 5" x 7' 0" x 0' 0"
Deck / Patio : 23' 9" x 12' 0" x 0' 0"
Living Room : 12' 8" x 12' 8" x 9' 0"
Storage (2nd Fl.) : 7' 6" x 1' 6" x 9' 0"
Foyer : 15' 1" x 9' 0" x 9' 0"
Great Room : 18' 5" x 14' 6" x 9' 0"
Kitchen : 17' 0" x 10' 0" x 9' 0"
Breakfast Room : 10' 0" x 7' 10" x 9' 0"
Utility Room : 12' 4" x 7' 4" x 9' 0"
Bonus Room (Vaulted): 12' 0" x 28' 2" x 8' 0"
Garage : 24' 0" x 24' 8" x 0' 0"
Garage Storage : 11' 4" x 11' 0" x 0' 0"
Master Bedroom : 12' 8" x 18' 0" x 9' 0"
Bedroom #2 : 12' 9" x 10' 0" x 9' 0"
Bedroom #3 : 12' 8" x 12' 8" x 9' 0"
Bedroom #4 : 12' 8" x 11' 0" x 9' 0"